It was December 20 1942. The Italian Bersaglieri Regiment approached the Russian town of Meshkov in their retreat. The Russians got there ahead of them and used its “fairy tale castle” ie. catello fatato cathedral as a strongpoint. It was dark, it was extremely cold and yet the cathedral was illuminated by a portion of the building that was on fire. Italian Turn 1 After the Movement Phase : The NVR (“Night Vision Range”) was 5, so the screaming Italians were spotted. The Russians tried to break as many Italian squads as they could. Italian squads have a moral level of 7 and a broken side morale of 6. 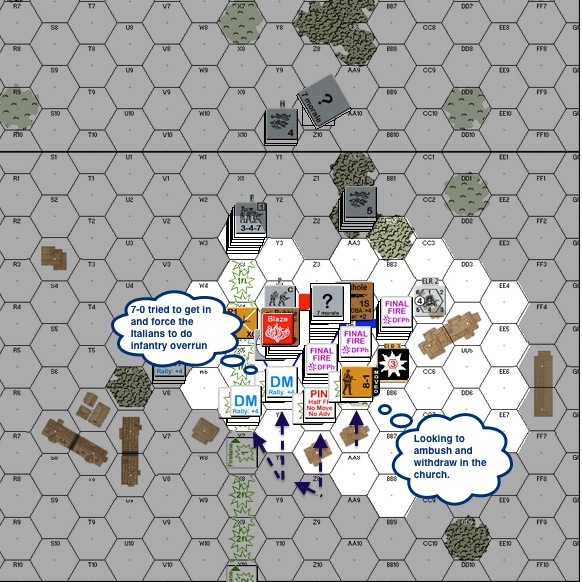 At night, units don’t get to remove their “DM” status until they roll less than its current printed morale. Running with 4 leaders (2 of them 6+1), these Italian should be very hard to rally once they break. Turns out it was the Russians who couldn’t rally for most of the game. The Italian 6+1’s were rather successful in convincing their troops to get back into the fight. 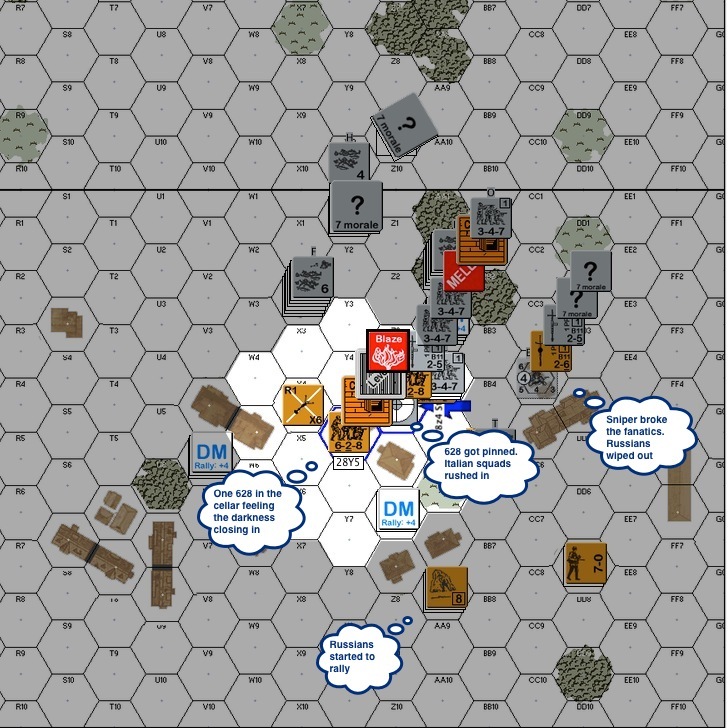 Russian Turn 1 After Advance Fire Phase : The Russian should perhaps have skulked at least part of their forces but I was determined to break a few more Italian squads. The Italians fired their Austrian made Cannone da 47/32 (ROF3), broke a squad on the ground level of the church and the heavy machine gun (“HMG”) team in the trench next to it. The HMG was later lost to the Italians and never served under Russian use again. Katya, our Russian sniper did miracles though! She identified an 8-1 leader from a stack of brokies and put a hole through his head. He was the highest ranking leader the Italians had and the only one with a negative modifier! Italian Turn 3 : The Russian couldn’t find any star shells!! Since illuminated units cannot see into the darkness outside the zone of illumination, it was safe for the Italians to move around the rim of blaze illumination and sneak an Italian squad into the cathedral. The Italians had also jumped both of my flanks and tied them down in mêlée. Given the huge disparity inmanpower, the Russians should have done a fighting retreat and leverage on their advantage in troop quality. Once the Italians closed, the difference in morale level was gone and they could keep reinforcing any mêlée. 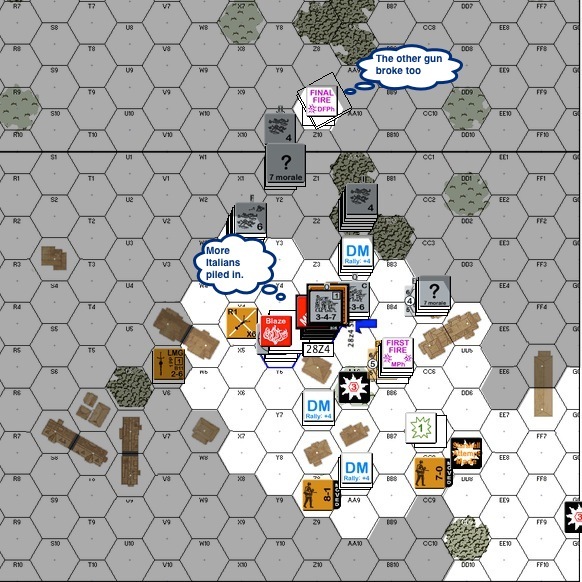 Case in point : the Russian’s right flank got a little agitated and turned fanatic along with the production of a hero (I promptly named him after my esteemed opponent .. heh heh), the Italians jumped on them immediately in the Close Combat phase, nullifying their qualities. 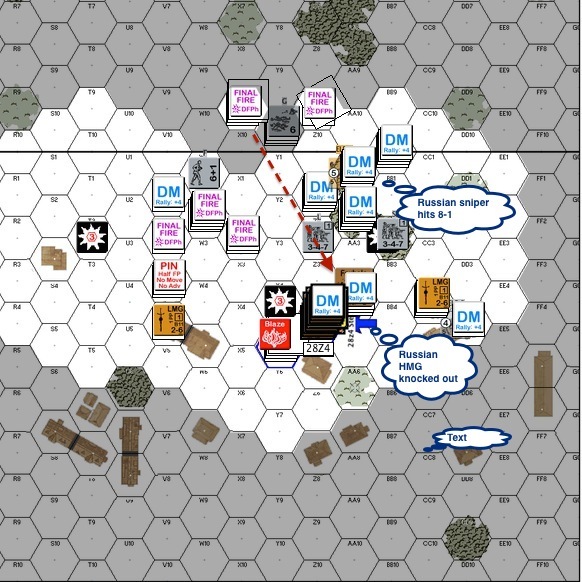 Russian Turn 3 Close Combat Phase : There wasn’t a lot to do in this Russian turn. The fellas steadfastly refused to be rallied. Since one of the Italian guns malfunctioned and the Russian SMG squads hid in fortified cellars, there wasn’t much damage. One of those Russian SMG squad decided to come out of hiding however, advanced up to see if it can ambush the Italian squad up top. It didn’t, but it took out the Italian squad anyway in close combat. In face of all the firepower and the important job it had to do, advancing up was a risk. However the act might burn more time from the Italians. The sparky Katya (sniper) continued to work hard, she found a 7-0 in another big stack of brokies and wounded him. The Italians had 2 healthy 6+1’s left. Both of the Russian flanks continued to be tied down in mêlée. 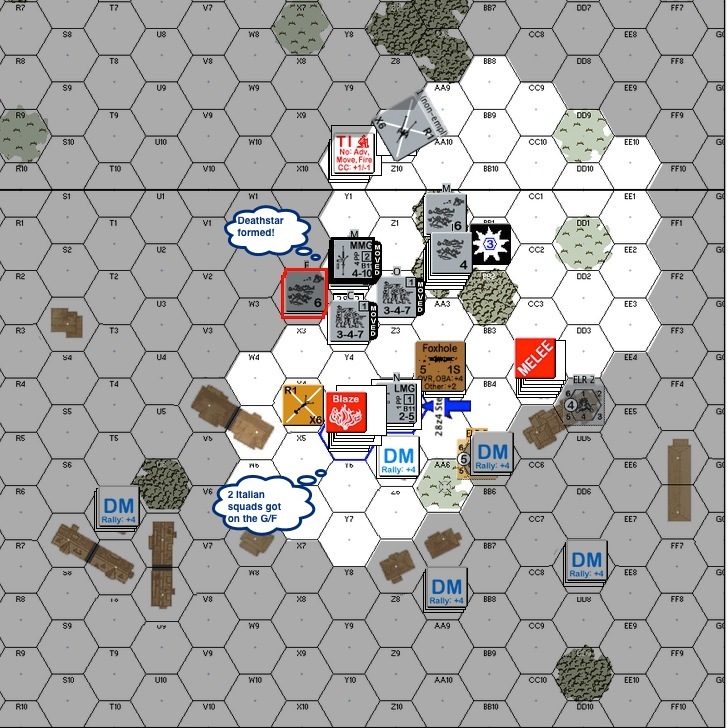 Italian Turn 4 After the Movement Phase : There were only 3 functional Russian squads left : 1 rifle squad and 2 SMG squads in the cellars. The rifle squad spit out a fire lane with the Italian Breda M30 LMG, just to deter the Italians from rounding the building on the right. As luck would have it, the Italian squad on the lower right in the dark would be hit and broken by Katya, who was obviously making it a late night tonight. Italian Turn 4 later in Close Combat : Two Italian squads made it into the left side of the cathedral. There’s still a concealed SMG squad in the left cellar. Since the cellars were fortified, they would need to pin or to break the Russian SMG squads before they could go in for close combat! 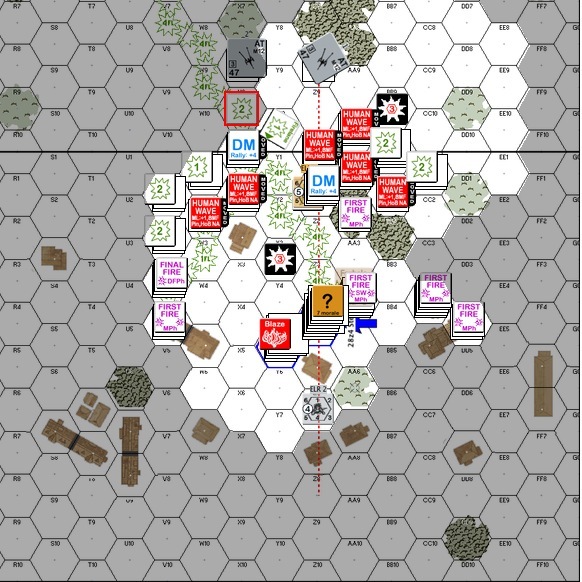 Russian Turn 4 : The Italians continued to rally quite well, although they had some casualties from the cold (Extreme Winter E.3.742). The Russians on the hand were still hanging on with a few squads. 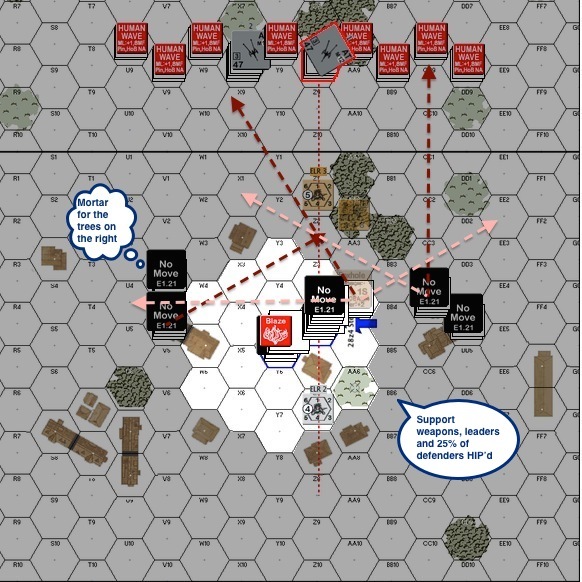 To make matters worse, the German sniper showed up an pinned the fanatic Russian squad in the midst of their mêlée on the right. Fortunately they survived and the fight continued, tying down that flank still for the Russians. 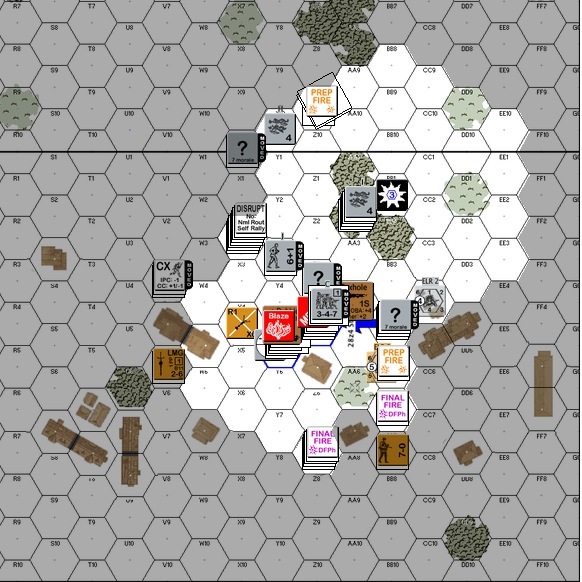 Italian Turn 5: Again, the Russians had no luck with star shells, and the Italians moved in. The Italians managed to pin the Russian SMG squad in the cellar on the right and so two Italian squads advanced downstairs to say hello. The mêlée on the far right was hit by German snipers again! The Russian fanatic squad was broken and they were all killed when the hero found himself fighting the Russians alone. The Russians outside were beginning to rally but listening to the sounds around them, SMG squad in the cellar on the left felt the darkness rolling rapidly in. 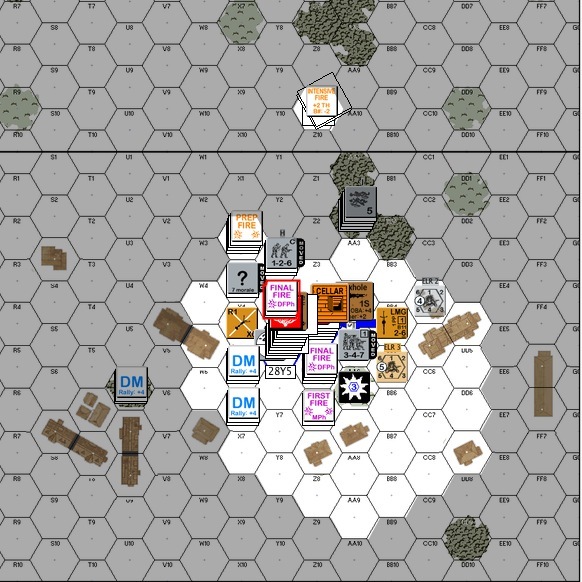 Russian Turn 5 : The Italians got star shells in some choice positions! Nonetheless the rallied Russian troops started to move back. Fortunately, the other Italian gun broke as well, adding to the Russians’ fighting chance. Italian Turn 6 : GUSTS!! The burning first floor of the cathedral collapsed! Good thing it didn’t crash into the cellar. The Italians had to think defence now. The Russians were getting back into the fight from the lower left of the map. The Italians had to get into blocking positions while continuing to reinforce the mêlée. The Russians couldn’t do much about stopping the Italians from reinforcing the cathedral. You might also notice that the remaining Italian gun was operational now and again tried pounding the cellars. Russian Turn 6 : The Russians plodded towards the sounds of gunfire inside the cathedral. First up was the 7-0 who looked to pop into the church hex on the left. The choice for the Italians was either to spend firepower on him or to let him get into the ground floor and make the Italians do a +3 task check for “Infantry Overrides” in next turn to get in. They shot him. Next up is a Guards rifle squad that broke against the fire lane on the far left. It looked even tougher on the right. One squad got pinned and finally the last squad moved in with the 8-1. Russians elites are stealthy and Italians are lax. If the Russians could get an ambush they could infiltrate into the cathedral. Unfortunately, it was the Russians who got ambushed, and the Italian squad withdrew into the cathedral. At this moment, the cathedral cellar on the left was held by a good order Russian SMG squad and in the right, there was a mêlée raging on between a Russian squad and two Italian squads. The Russian counterattack could only watch from outside the cathedral. 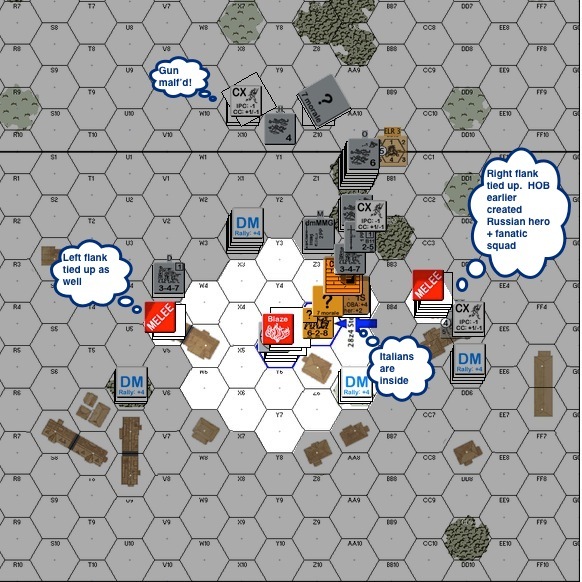 Italian Final Turn : It all went down to one question (read : dice roll) – whether the Italians could break or pin the Russian SMG squad holding out in the left cellar so that the Italians have a chance in close combat. The Italians moved, trying to focus more fire power into the cellar during advancing fire. The Russians outside managed to pin one of the 3 squads that got into the cathedral, directly above the stubborn Russian SMG squad. The Italians mustered up a firepower of 6, so that was a FP6+4 shot. The Italians rolled an 11. 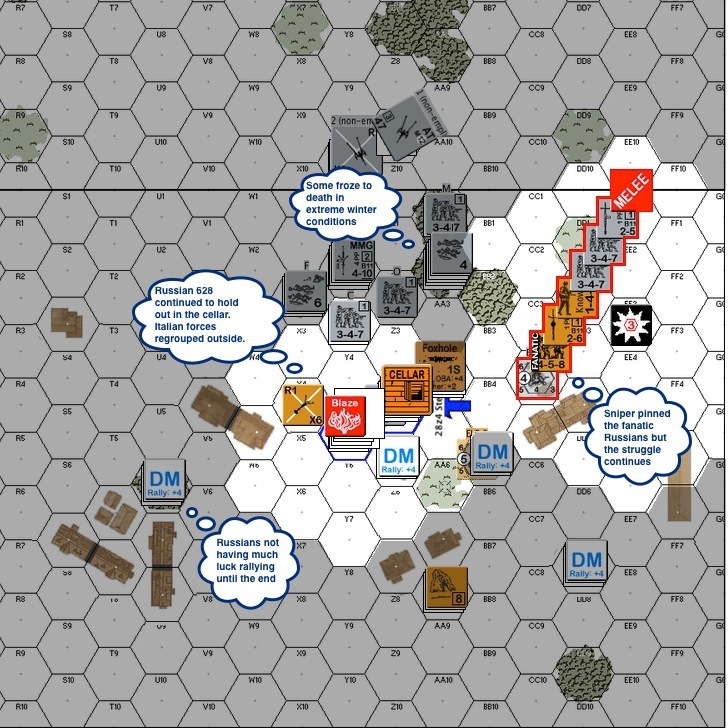 This entry was posted in Game Play and tagged AAR, Advanced Squad Leader, ASL, Board Game, board wargame, ETO, Hong Kong, Multi-Man Publishing, night, Russian, Scenario, VASL. Bookmark the permalink. Excellent AAR. Looks like a very fun scenario, and I just love when random stuff like Gusts change everything! Great write up as always. So how did you find ‘night’ then – I haven’t been brave enough for that rule section yet.. This probably my 7th game playing night. The changing clouds and moon phases, coupled with star shells etc makes for a constantly shifting battlefield. 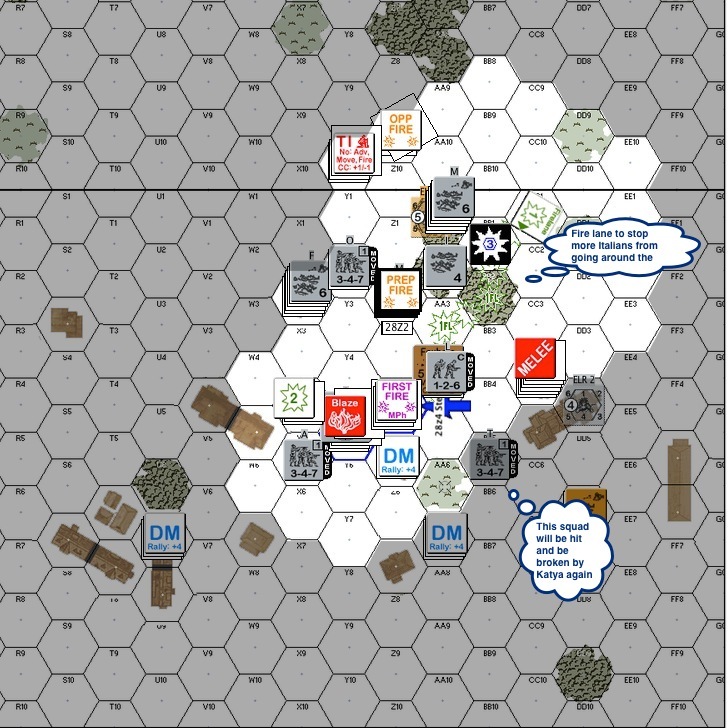 Combat tends erupt from folks sneaking up trying not to trigger the defender’s NO MOVE counters into short ranged and vicious firefights. It’s really a lot of fun! 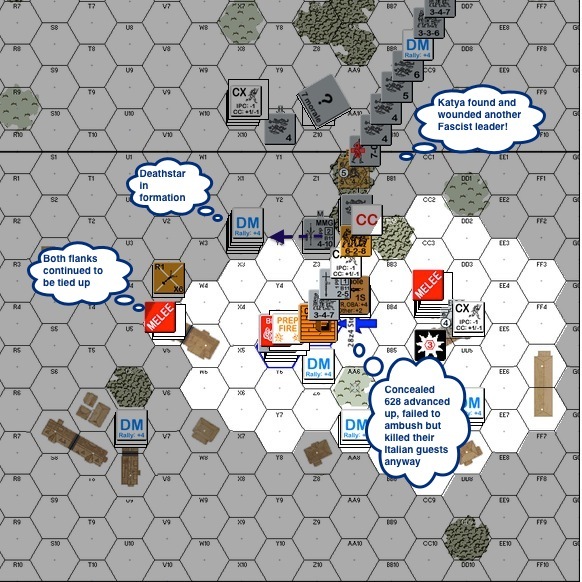 ← DB081 Lack of Discernment AAR – Defending!